How to use News Filter in WallStreet Forex Robot 2.0 Evolution! In the Forex Market there may occur high impact news events which can affect the robot's performance. Due to this, we have developed inteligent news filter system for WallStreet Forex Robot 2.0 Evolution and WallStreet Recovery Pro 2.0 Evolution. When you activate this system you will be able to see the coming event on the info box on the chart. When you activate News Filter it is really important to use correct GMT Offset of your broker. You have to make sure that you set the correct GMT Offset. By default AutoGMT_Offset manages GMT Offset calculation but in rare situation it is possible to have wrong GMT offset. For that reason, you will need to set GMT Offset by yourself. In such a case, you must switch AutoGMT_Offset to false and enter the correct value in ManualGMT_Offset. Another very important parameter for the calculation of GMT offset is DST_Usage. It has to be used when your broker has winter/summer time. AutoGMT_Offset true/false – this parameter controls the GMT Offset calculation method. In most of the cases, the automatic GMT value is correct. However, in some cases, you may need to enter the GMT Offset by yourself. In this case, switch AutoGMT_Offset to false and enter the value you need in the ManualGMT_Offset parameter. ManualGMT_Offset – in case you switch to AutoGMT_Offset=false, the value of this parameter should be the right GMT Offset of your broker (usually, the winter GMT offset). As well, in case you perform a backtest, you should enter here the correct GMT Offset for the historical data you use – otherwise, the backtest will be incorrect. DST_Usage true/false – activates the automatic DST (Daylight Saving Time) correction. Since the backtest is good which include period of news can I just run the robot without interferring all the setting inside the programme? PATRICK LOW: Since the backtest is good which include period of news can I just run the robot without interferring all the setting inside the programme? Yes you can trade with the default settings of the robot. By default the News Filter is disabled. You don't need to change anything in the robot settings. Is the code for the robot open source? Can I change it? Jaap: Is the code for the robot open source? Can I change it? Hello Jaap, WallStreet 2.0 Evolution is not open source. You cannot change its source code. You can only change its settings and adapt it to your needs and expectations. I would like to know if you have the possibility to configure the beginning of the order and the end by candles and times? FRANCISCO JOSE PINTO DE ARAUJO: I would like to know if you have the possibility to configure the beginning of the order and the end by candles and times? Please login to the member area and create a support ticket by explaining what do you mean exactly. And our developers will give you a hand, for sure. I purchased Wall Street Forex Robot 2.0 Evolution and installed it correctly and activated some Demo accounts, though the Robot EA is active but it has not come up with any trade for over a day now. Please what must I do to make the EA make active trades? 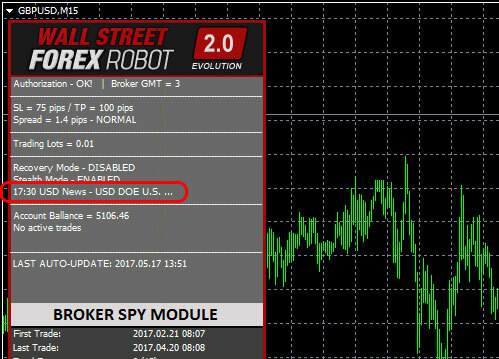 WallStreet Forex Robot 2.0 Evolution trades whenever there are strong signals from the brokers. You mentioned that you have traded 1 day, it is possible not to have trades for 1 or more days , we suggest you to be patient, it will trade when there are good opportunities for the robot. For more info please contact the support team. Do I need to set up a news website? If so, which site? Ou Yanglei: Do I need to set up a news website? If so, which site? You do not need to set up any website for news. All it is needed to be done is to activate the news filter, for details please read the article above. If something is not clear you can contact support team and we will be happy to help you.